He'll be the cutest little cowboy around in his fancy Cowbaby Hole in the Wall Boots from Roper. Brown Embossed Caiman Faux Leather Vamp Enjoy every sunny day with the beautiful Roper® Tabitha thong sandal! Under all that business of the Roper® Kids Lexi is a bit of fun, just like your favorite gal! Glitter design through laser western-inspired cutouts on shaft. Roper Girls Cowboy Boot For authentic, classic, western apparel at an affordable price, Roper is the brand to trust. For unbeatable comfort and cute southwestern style, slip into the Johnnie Driving Moc from Roper. Add a little sassy Southwestern style to your summer look with Roper® Jezebel sandal! These slip ons by Roper have a blue denim canvas fabric with an Aztec blue vamp . For authentic, classic, western apparel at an affordable price, Roper is the brand to trust. Feel all-day comfort when you wear these chukka shoes from Roper. 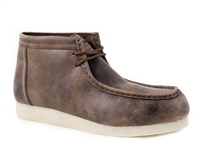 Enjoy the long drives ahead when you pull on these driving moc shoes from Roper. Johnnie Slip-On Shoes Kick off your boots and slip into these driving moc shoes from Roper. 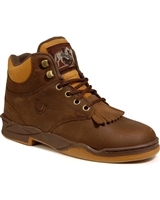 Men's Loaded Western Boots When you put these roper boots, you exude timeless western fashion. These Roper boots are designed with comfort, durability, quality materials and craftsmanship in mind!